I made some progress today on my project to add additional charging capability and/or add chademo capability. Today I used a brusa charger to charge the battery via the high voltage junction box. The unknown was whether the car would accept current from an external source without faulting. Well, now I know it will accept current, and the chademo project seems to have the green light for now. Last edited by sefs on Fri Jan 23, 2015 6:05 am, edited 1 time in total. I've wondered how external chargers work....it's clear you can push charge into the battery pack and monitor the overall voltage, but what (if anything) do you do to monitor the temperatures and cell balance? Or is that the reason fast charging is limited to maybe 80%? Don't monitor the balance, just charge the whole pack to a safe and reasonable level? I could imagine that temperatures are not an issue...is the idea that the TMS will do its job no matter what the cause of the battery heating? It doesn't care whether from a fast charge or a hot sunny day? Cooling would be handled by the car. While it's in ready to drive, it will cool the battery to keep it in the temperature range. The only thing I have to work on is the battery heating for winter. The battery heaters only activate while charging. I have done some tinkering with bypassing the heater relays for force the heaters to run. As far as balancing, I'm not too worried. A quick charge or two should not take it too off balanced. It will be balanced next time I nominally charge. I was thinking you could possibly plug in the regular EVSE cable and set it to value charge at some odd time. 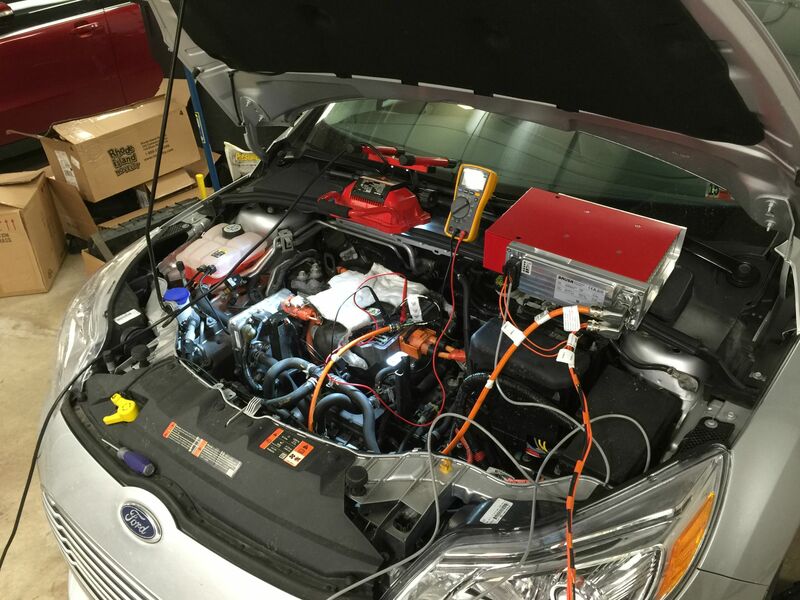 I think that would cause the car to cool the battery if needed...but you are right, you will probably quick charge and be on the road promptly so no harm in any event. And yes, I agree about the balancing. particularly if you charge it only to say 80% which I think is typical of fast chargers, some imbalance not a factor. Very clever....I like the idea! Will this void your warranty? Looks like you had to cut through the insulation under the hood. If I damage a related component, it wouldn't be covered. But no, I didn't have to cut anything, this is completely reversible. Some more testing tonight. I ran the Brusa boosting the OBC from 2.5% SOC up to 82.5% SOC. Any guesses for the time? 1 hour and 30 minutes! 51% SOC in 50 minutes! I've run the numbers, and I think I'm going to add a total of 2 Brusa's. I'll set it up so I can charge off of two EVSE's at once. I'll have to revise my estimator (because I was estimating that 80% SOC was going to take 1:45 and I beat that by 15 minutes), but I think I should be able to do 80% in 60-70 minutes. Data from last night's charging session with the Brusa. First of all, let me salute you for your ambitious project and the way you are approaching it. 2. Does any sort of cell balancing take place? I would suspect not...in this case, is there some way you can know to terminate charging? Or is the plan to simply terminate fast charge early enough that there is no risk of any cell reaching full charge?